Electrical vehicle charging stations have been mushrooming the world-over in the past decade, but what’s different about this one is it will also feature offices, shopping elements and eateries. 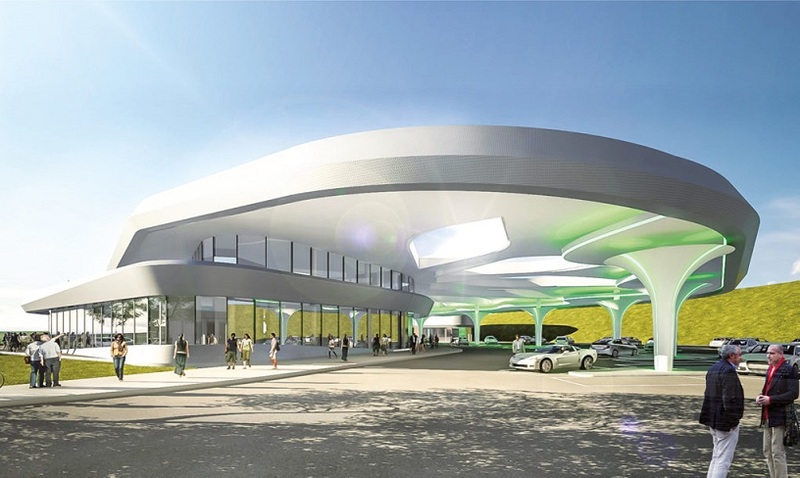 Such a development goes beyond the orthodox concept of a gas station, but more importantly, it gives rise to a new development concept that could become a viable trend in the future. Green roofs atop the charging station serve as parks for people to rest. The idea is such hubs would cater to throngs of people if the vision of a complete EV-mobile future becomes a reality. In the age of wireless connectivity, patrons could also order food before they arrive or partake in other forms of entertainment while they wait for their cars to charge. Commuters might be able to park and charge their cars simultaneously in DC parking, even while working in the offices onsite, said German company Sortimo International GmbH of its plan, reported on green design and technology website Inhabitat. There are 144 charging ports planned of which 24 are supra-superchargers. Sortimo, which has a presence in 35 countries, manufactures van racking systems and mobile transport solutions. The company said 4,000 cars a day could be charged at the upcoming Innovationspark Zusmarshausen charging station located near the A8 highway in Germany. 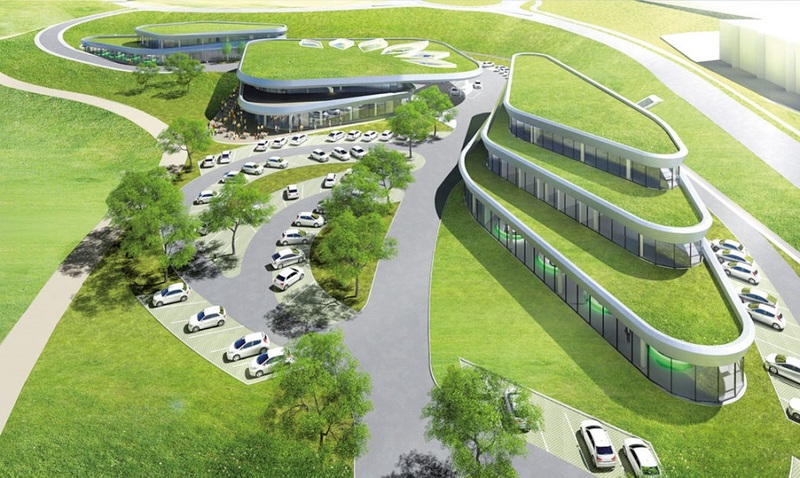 Architecturally aware of the environment, Sortimo envisions people resting in a park at the charging station as well, so the station would be topped with green roofs. Renewable energy is part of its plan for the massive charging station. Solar power can be stored at the station and used during peak times in a network of surrounding companies and private households. The massive EV charging station is expected to pop up next year. The charging station is also integrated into Innovationspark Zusmarshausen’s thermal station management, so waste heat can help supply the buildings. A total of 24 of the 144 charging ports could be supra-superchargers with charging capacity of 350kW, beating out Tesla Supercharger’s 150kW capacity. Innovationspark Zusmarshausen could offer savings of 29.5 million litres or 7.8 million gallons of fuel and save nearly 60,000 metric tons of carbon dioxide every year. As Germany increases EV production and the government targets to make the country the leading market for electric mobility and to further trim transport emissions, it’s only natural that more charging stations are needed. 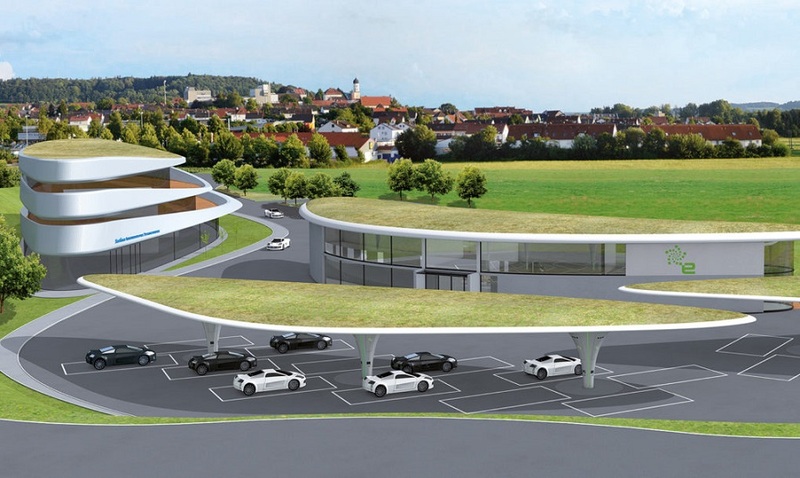 Innovationspark Zusmarshausen will be the world’s largest EV charging station with 144 charging ports.